I recently picked up a very cool WW2 Tam-O-Shanter type hat. These are sometimes called a Bonnet or a Balmoral or just plan WW2 cap. Tam o’ Shanter, is derived from a hero in one of Robert Burns (scottish poet) poems Tam o’ Shanter. The Poem was written in 1790 and soon after published in 1791. It’s a poem about a drunk who encounters witches and warlocks and the devil at a hunted church while riding home during a storm. As he watches them dance and sing he eventually can’t contain himself and calls out `Weel done, cutty-sark!’ (cutty-sark : “short shirt”). The music and the singing stop and they begin to chase him. He eventually escapes over a river which they will not cross with his horse named Meg. The moral of the poem is to be true to your love and beware of drinking too much and chasing after short skirts. My particular Tam-O-Shanter hat had the markings D.M.C. Cap Mfg.Co.LTD. made in Winnipeg Canada. The big “C” stands for Canada. You can see the various markings below for countries other than the UK, which simply used the Broad Arrow. The hat was issued in 1941 and is in pristine condition. The hat also came with a toorie (pom-pom). A tartan patch and badge were usually present on these hats and mine came with both. 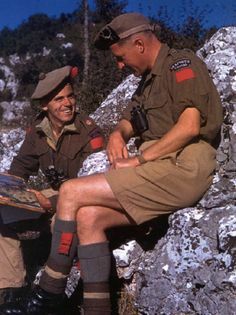 The tartan patch and badge appears to be a Cameron Highlanders unit. 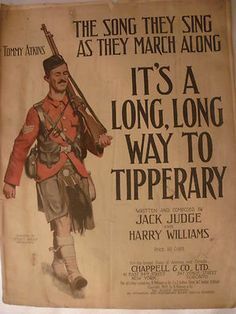 I had been looking for a British or Scottish cap to go with my Highlander Kilt and this fit the bill. The hats are still in use by the Royal Regiment of Scotland. 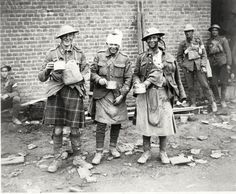 Other regiments of the British and Canadian Forces continue to wear the ToS as undress and working headgear. 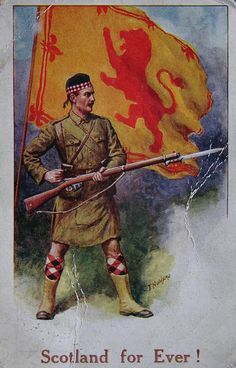 The Royal Regiment of Scotland identify themselves by wearing distinctive colored hackles on their bonnets.